The quality of each antisera must be determined empirically. Commercially available ATM antibodies can be found through the AntibodyResource website. To find antibodies against the ATM protein kinase (vs. the ATM interactor ATMIN), enter ATM kinase or serine-protein kinase ATM into the search window. AMS Biotechnology (Europe) Ltd. has been providing life science researchers with innovative genomics, proteomics and antibody products and services for over 20 years. For information regarding ATM antisera and ATM related reagents, please visit their website. Commercial ATM antibodies can also be found through antibodies-online.com. Antibodies.com supplies commercial antibodies, including anti-ATM antibodies, proteins and assays to researchers worldwide. Want assistance finding an antibody? QED Bioscience’s Antibody Assist Service can help. Other anti-ATM antisera originally produced in Dr. Shiloh’s laboratory are now available from Sigma-Aldrich. Labome is a free site that searches the web to locate providers of antibodies and other reagents. Labome also reviews literature to identify those antibodies that have been used in formal, peer-reviewed publications. 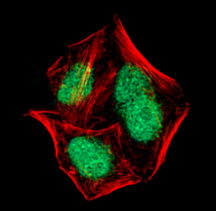 Find their ATM antibody review. LifeSpan BioSciences, Inc. offers a catalog of almost 80,000 antibodies, many of which have been validated for immunohistochemistry, including antibodies against ATM. Novus Biologicals, Inc. is a supplier of high quality antibodies and recombinant proteins. They have a comprehensive list of ATM antibodies as well as a full line of over 15,000 primary antibodies. Novus Biologicals was a sponsor of the 2006 International Workshop on ATM. R&D Systems offers an affinity-purified rabbit anti-phospho-ATM (S1981) antibody. For more details, please visit their website or see the chart of Commercially Produced Antibodies against ATM. In addition to their monoclonal ATM protein kinase pS1981 antisera, Rockland Immunochemicals also provides Biotin and Peroxidase conjugated forms of this antisera. For pricing and ordering please call 800.656.ROCK.